Sue is based in the Lewisham area of south-east London. She offers quality treatments from the New Cross Natural Therapy Centre SE14, opposite New Cross station and from Honor Oak Park SE23, close to Honor Oak station. She also provides mobile treatments in the surrounding areas. Sue is well established as a business offering massage therapy, aromatherapy and reflexology and regularly treats other professionals in complementary medicine, as well as a wide variety of others such as psychotherapists, doctors, dancers, sports professionals and musicians. 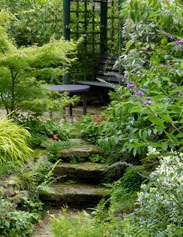 Whatever your needs, each holistic treatment is tailored individually and is delivered with skill and care. During massage, areas of tension are worked on at the depth you need for the relief of aches and pains, enabling you to relax and feel revitalized when you leave. Knotted, tense, painful or fatigued muscles are soothed and invigorated. Aromatherapy is a soothing massage which will envelop you in the wonderful aromas of essential oils. Specific oils are chosen to suit you. Reflexology is a very relaxing treatment for the feet through which, it is said, all systems of the body can be accessed and brought into a state of balance. Please see this leaflet for more information. Sue has many years experience working privately, as well as within the NHS where she ran a clinic for seven years. Patients were referred in by GPs, physiotherapists and others. This involved working efficiently, whilst sensitively, to find the root of the problem, bringing maximum results in a relatively short treatment time. Adults of all ages attended the clinic, with many people in chronic pain. For example with back/neck pain, old or recent injuries, arthritis, trapped nerve pain, sciatica, or suffering from stress, depression or anxiety. Sue also worked at the Maudsley Hospital offering massage treatments to people with severe and enduring mental health problems. Sue qualified in massage in 1989 at the Churchill Centre, Marble Arch, aromatherapy in 1998 at Greenwich, and reflexology in 2004 at Lewisham. All qualifications were gained with ITEC. She is a member of the Complementary Therapists Association, www.embodyforyou.com and is fully insured. Sue is registered with CNHC, the government body for the regulation of complementary practitioners, and the 'gold standard' for complementary practitioners. 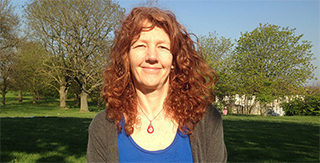 Sue is a fully qualified counsellor and offers counselling at New Cross Natural Therapy Centre. Please visit the counselling page for more information. Treatments available Tuesday, Wednesday, Thursday, Friday, 1pm - 8pm and on Saturday afternoons 1pm - 5pm. Men welcome for treatment at New Cross.